Speakers come in a variety of categories. You could opt for a portable Bluetooth speaker to take with you on the road. Alternatively, you could prefer a Wi-Fi connected speaker capable of streaming content without the need for a host device. 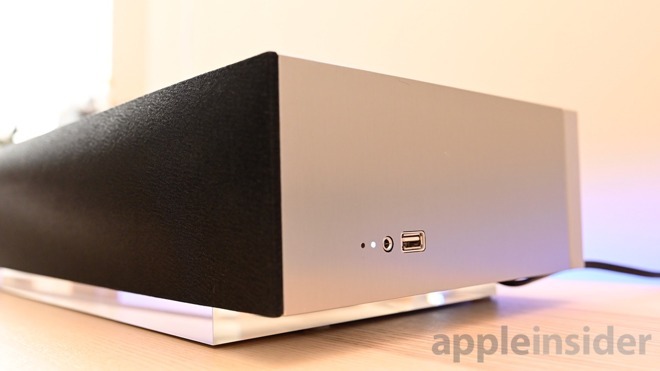 For Apple users, you may be looking for an AirPlay 2 speaker which carries all its own benefits. The Naim Mu-so falls into the latter two categories. This speaker isn't small and is easily overkill for small spaces. It puts out impressive, clear, loud sound that retains its fidelity no matter how loud you crank it. If you're looking for a smaller -- yet still capable speaker -- maybe gander at the Mu-so Qb. The Mu-so doesn't just sound stunning, but it is eye-catching as well with its sleek and modern design, swappable grille, transparent illuminated base, and metal body. Let's not gloss over this though, time to get into the details. Mu-so has the uncanny ability to quickly catch one's eye with a modern design language that Naim has chosen. There is quite a bit of heft to this speaker, due in part to the massive amplifiers internally, but also the aluminum enclosure. The top and sides are brushed aluminum while the back has a row of metal fans that double as a heatsink. Under the unit is a clear piece of acrylic with the Naim branding etched into the left side. A series of white LEDs from above will illuminate this base when situated on your shelf. Low light settings make this pop even more, but if you happen to be one of those who isn't a fan of the stylish lighting, it can be dimmed or disabled as well. The only inputs/outputs are located on the far right-hand side. There is a standard 3.5mm audio port, a USB-A port, and a status LED. A tiny pinhole sits to the left of those and is used to reset the device. Hidden on the underside is the power input which is largely kept hidden from view, other than the cord protruding. With the heatsink along the back, this was the best way to keep the visible exterior unmolested. Perched atop to the left are the only controls you need for the speaker. A tactile ring can be rotated to adjust the volume which gives feedback through a series of LEDs on the internal side of the ring. Also, there are options to change inputs, power the speaker on/off, track controls, and a quick-access radio button. All of the buttons are touch-sensitive with no physical moving parts and a cleaner surface. Unused buttons don't illuminate when unnecessary which makes the interface even simpler to use. When we used the controls, we felt we had to apply a bit more force than we initially expected. A quick, light touch may not activate the buttons. Touching the buttons with purpose ensures they are properly triggered. Lastly, the front of the speaker has a swooping 3D grille that adds to the whole experience. In the box is a standard black color, but additional hues can be picked up. Orange and red look great but we are particularly partial to the blue. This speaker has an large number of input options available to ensure you can play back your content whichever is best for you, in the best quality possible. Have music on a Mac, PC, or a NAS device? Shoot it over via Universal Plug n' Play (UPnP). If you don't want to connect over Wi-Fi, you can stream over Bluetooth with AptX support. 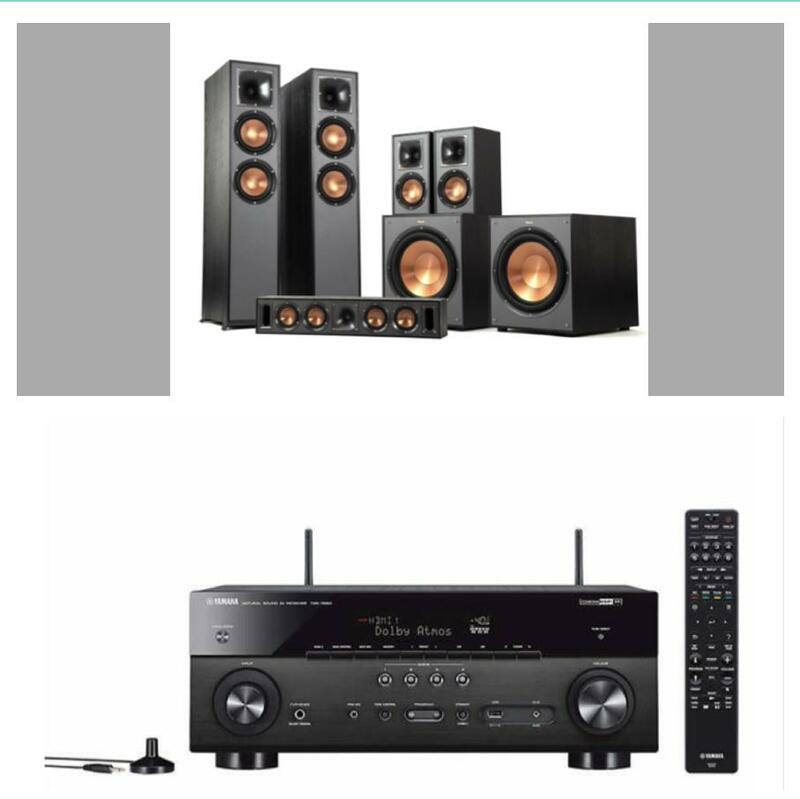 Otherwise, you can use digital optical, internet radio, USB, Tidal streaming, Spotify connect, or AirPlay. Naim natively supports multi-room playback with Mu-so and Mu-so Qb or other Naim streaming products. You can cast audio to up to four speakers via Wi-Fi and a fifth if connected over Ethernet. For Apple users, AirPlay 2 also offers this functionality. 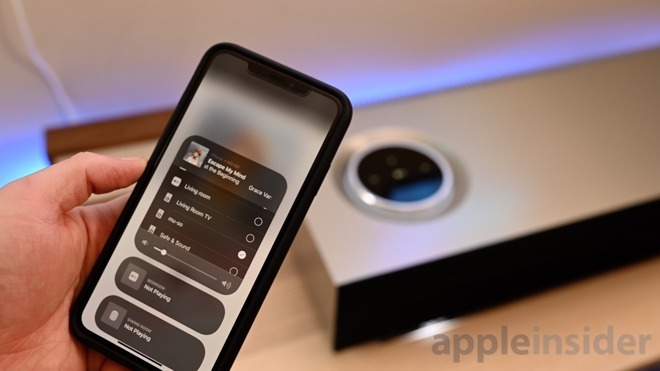 AirPlay 2 was added in 2018 via a software update and comes with several new features, but most noteworthy is multi-room streaming. 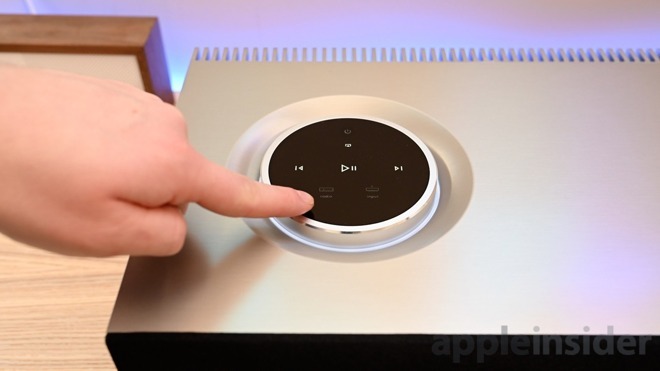 You can then stream to more than five rooms wirelessly and aren't limited to Naim speakers. From your iPhone or Siri, you can play your favorite tracks on your Sonos Beam, HomePod, Libratone Zipp, and Mu-so all simultaneously from anywhere in your house. We use AirPlay 2 often and find it to be more than suitable for streaming audio with great quality and no lapse in playback. In this case, it lets you keep a speaker such as the Sonos Beam on your TV stand and not strictly need a second speaker just for multi-room music playback. 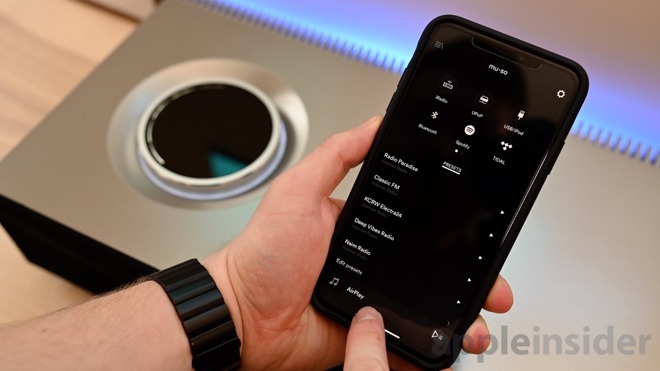 Much of the speaker can be controlled via the Naim app. Switching inputs, controlling the light, adjusting the volume, setting up multi-room, and changing room modes are all available from your iPhone or iPad. The app is cleanly laid out and is fairly easy to use, but we often got more annoyed with it than we should. 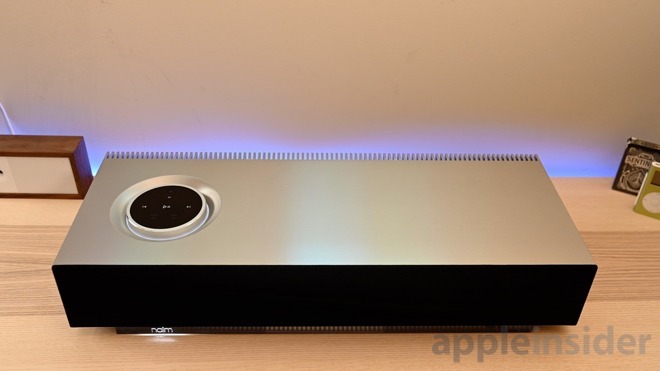 It frequently had issues discovering the speaker on our network, even though the speaker was on and available to use as an AirPlay 2 destination. A couple times we were forced to restart the speaker to get it working once more. On the positive side, we rarely needed to use the app. AirPlay 2 lets you adjust the volume which would have been the biggest use of the app for us. Hopefully, in the future, Naim will continue to push app updates to increase the stability and discovery abilities. As we do with any speaker or headphone review, we turn to our audio testing playlist on Apple Music which we streamed over AirPlay 2. As we settled in to listen to one of our go-to songs for high-volume audio -- Queen's Bohemian Rhapsody -- we were blown away by the sheer volume and soundspace this speaker is able to output. Even with the fullness of the sound it was able to traverse the acoustic nuances of the song with ease, keeping a sense of energy about it. Due to the six 75W class-D amplifiers internally, this thing is able to put out some noise. Even at the highest volume, which was tough to stay at for long periods of time in a smaller room, the audio stayed as crystal clear as it was when set to 20-percent. It did thicken up a bit on the high end but retained its overall fidelity. Highs were abundantly crisp with just a bit of an edge that we like to hear. The bass was forceful and we could feel it in our chests in bass-heavy tracks such as Joe Cocker's Come Together. With any hi-fi speaker, songs containing any instrumentals really come to life. The live recording of All for You and the subtle touches in Glitter & Gold are easily picked up on and are not as muddled as we normally hear with lesser speakers. If you'd like to up your audio game and pick up the Naim Mu-so, you can grab it from Crutchfield for $1,349.99. Would you be kind enough to share your Apple Music Testing Playlist? Queen and Joe Cocker? Really? EGAD. How about unamplified music recorded in concert halls? Orchestral. Choral. Chamber music. Lieder. Opera. That's the best way to test audio fidelity. 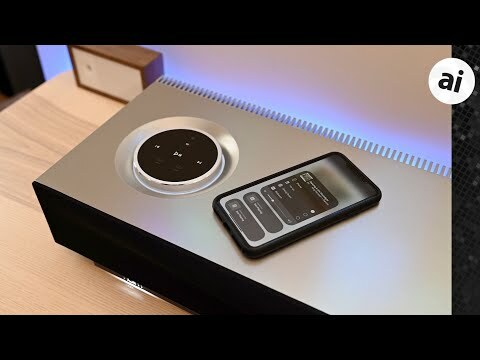 I have NAIM hi-fi equipment and it's fantastic stuff, so I would imagine this to be quite good..
"Nam Mu-so AirPlay 2 speaker will fill your home with style & powerful sound". This review reads like PR marketing fluff. 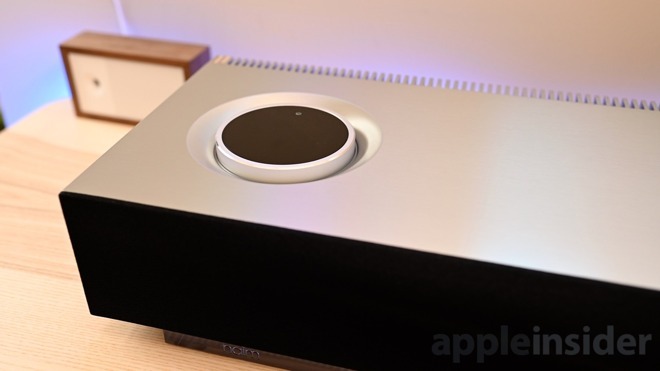 "Mu-so has the uncanny ability to quickly catch one's eye with a modern design language that Naim has chosen." Yep. And no table of specs. Optical S/PDIF (TosLink) up to 96kHz"
Is that in the 3.5mm jack? 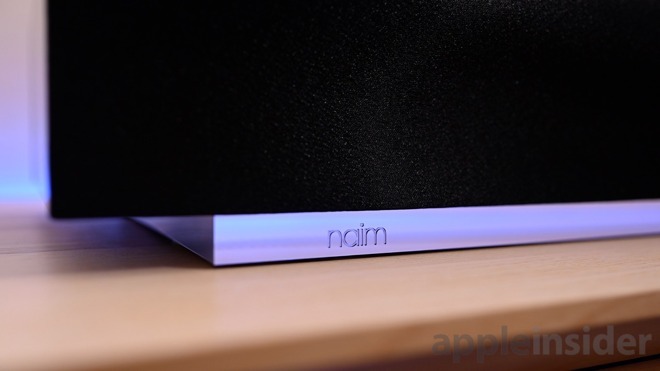 Apple Insider reviewing something from Naim? Wow! Please note, the Mu-So has been Roon tested. What that means is it can work with the most powerful and innovative musical interface available which also integrates with the complete library of TIDAL and Qobuz. Very exciting times indeed! No thanks, Joe Cocker it is. Did they test the multi-room streaming? It didn't sound like they have a second unit. Would be nice to know how these work in multi-room support without using AirPlay to test if there are any network drops with the software. I don't have any problems with my Sonos units but am wondering how other systems like BlueSound and PlayFi work. But AirPlay2 is definitely handy. How can an amp push out 450w of power if the system only chews 17w?